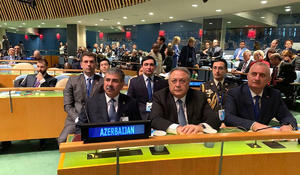 On March 29, Minister of Defense of the Republic of Azerbaijan, Colonel General Zakir Hasanov, who is on a working visit to the United States, took part in the UN Peacekeeping Ministerial Conference held at the level of Defense Ministers in New York, Trend reports citing Azerbaijan's Defense Ministry. As part of the visit to the USA, on March 29, the Minister of Defense of the Republic of Azerbaijan, Colonel General Zakir Hasanov has met with Alexandre Zouev, the UN Assistant Secretary-General for Rule of Law and Security Institutions, Trend reports March 29 citing Azerbaijan's Defense Ministry. Azerbaijan's Defense Minister, Colonel-General Zakir Hasanov will take part in a trilateral meeting of the defense ministers of Azerbaijan, Turkey and Georgia in the Turkish city of Giresun on March 31, the Azerbaijani Defense Ministry said on March 24. Relations between Azerbaijan and Saudi Arabia are successfully developing in different fields, Azerbaijan’s Defense Minister, Colonel General Zakir Hasanov said on February 6. 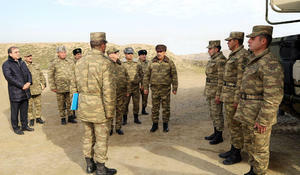 Under the instruction of the President of the Republic of Azerbaijan, Supreme Commander-in-Chief of the Armed Forces, Ilham Aliyev, Assistant to the Azerbaijani President on Work with Law Enforcement Bodies and Military Issues Fuad Alasgarov and Minister of Defense Colonel General Zakir Hasanov visited military units stationed in the frontline zone, the country’s Defense Ministry said in a message Jan. 24. 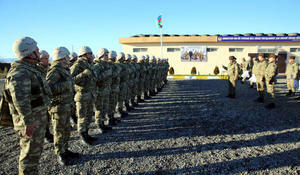 Azerbaijani Defense Minister, Colonel General Zakir Hasanov and the leadership of the ministry visited military units stationed in the frontline zone, the ministry reported on December 26. 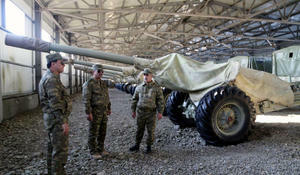 Under the instruction of the President of the Republic of Azerbaijan, Supreme Commander-in-Chief Ilham Aliyev, Minister of Defense, Colonel General Zakir Hasanov and the ministry official have inspected the combat readiness of the rocket and artillery units deployed in the frontline zone, said the country’s Defense Ministry in a message Nov. 29. Azerbaijani defense minister, Colonel-General Zakir Hasanov will pay a visit to Minsk on Oct. 8 at the invitation of his Belarusian counterpart, Lieutenant-General Andrei Ravkov, the Azerbaijani Defense Ministry said in a message Oct. 6. 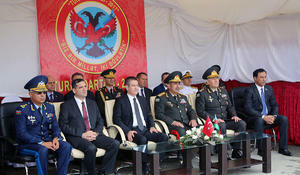 Azerbaijan’s Minister of Defense, Colonel General Zakir Hasanov and his Turkish counterpart Nurettin Canikli took part in the closing ceremony of the joint flight and tactical exercises, dubbed TurAz Qartalı-2017, held in Azerbaijan, the country’s Defense Ministry said in a message Sept. 29.